Kingman gained revenge on his QIPCO 2000 Guineas conqueror Night Of Thunder with a sparkling turn of foot in today's St James's Palace Stakes. Owned and bred by Khalid Abdullah, trained by John Gosden and ridden by James Doyle, Kingman won by two and a quarter lengths, and there was another length back to third-placed Outstrip. Gosden said: "He showed a lot when winning his maiden last year and they made him favourite for the Guineas, which was a bit hard on the horse, but fortunately he doesn't read the newspapers. He just sleeps and eats and races. "He's been training well and I couldn't be more delighted with him." Richard Hannon ran two horses in the race, the second plus unplaced Toormore, and Gosden said: "I was really impressed with Richard Hannon's tactics which completely fooled us all. They held Toormore back and sent on Night Of Thunder, who stays really well. That was really clever, but I'm pleased James didn't think, 'oh, oh, I'm in trouble now' when Richard Hughes [on the runner-up] slowed it down [approaching the home straight]. "Our horse has won in the way I wanted him to do it, and the jockey has shown his skill. A lot of people would have panicked at the head of the straight, seeing their main rival slowing it down, then kicking on and building a good lead, but he waited, which was great. "It's two-one to us [in battles with Night Of Thunder] but maybe they'll meet again in the Sussex Stakes or QE II, or maybe at Deauville. "We've seen a lovely horse win the Queen Anne [Toronado], Hughesie was great on Sole Power and I thought the Coventry Stakes winner [The Wow Factor] was superb - this is the supreme day's racing. We open this meeting with a big bang - it's like putting the firework display on back to front, but it's wonderful." James Doyle the winning jockey expressed his delight: "They can't go quick enough for him. He has such a good crusing speed and wants to go quicker. The lads at home have done well with him and it is good to pay back the faith given to me by Khalid Abdullah so I want to thank him. "Despite losing in the Guineas I always took the opinion he was a better horse. He has a potent turn of foot and I enjoyed it so much. You push a button and he is away, it was just brilliant. I could afford to be patient with his turn of foot and today he showed what sort of horse he is." 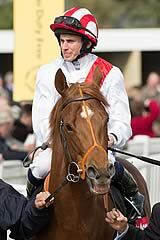 Richard Hannon is thinking of stepping Night Of Thunder up to 10 furlongs in the Coral-Eclipse at Sandown next month. The trainer said: "There was not much speed in the race and we wanted to make it a good test. He has run well but was beaten fair and square. Looking at that he might get 10 furlongs. I think the winner probably has a bit more of a turn of foot than us. "We might go to the Eclipse. 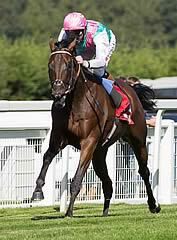 We won't know if he gets 10 furlongs until we try it but I think he will get the trip and we will avoid Kingman!" Night Of Thunder's jockey Richard Hughes said he wanted to make the running: "Our understanding was that the Greenham was very slow and Kingman beat us and the Guineas was very fast and we beat him. "I was drawn one, there were two 50/1 shots drawn two and three and James (Doyle) was drawn in seven, so Kingman was always going to get the clear run down the outside and I didn't want to be stuck behind and let him get the first run. "I thought why can't I make the running? I got it nice and easy, I kicked first and I couldn't believe one went by me as I was still quickening when Kingman passed me. "My horse has run a hell of a race - the way we've pulled clear. I think the winner is possibly a July Cup winner and we can go to the Eclipse." Godolphin's Outstrip returned to form and rallied to be third. Trainer Charlie Appleby said: "I am delighted as he has run well. It has put the confidence back in us which was slightly knocked out after the Guineas. "We had a genuine excuse in the Guineas - he scoped dirty that day - and you can now put a line through the run. His preparation today was as good as it was going into the Guineas. "He has trained on and was beaten here by two good horses. We will sit down and discuss plans but I'd like to see him step up to 10 furlongs. "I think there is more to come. 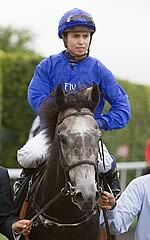 William (Buick) was very pleased with him and Outstrip settled very well. He is not the most robust of horses but he does take his racing quite well."